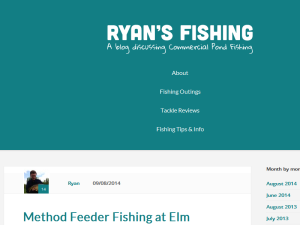 This what your Ryan's Fishing Blog Blog Ad will look like to visitors! Of course you will want to use keywords and ad targeting to get the most out of your ad campaign! So purchase an ad space today before there all gone! So I recently upgraded to, what I call, a proper seat box. One with adjustable legs, footplate, comfy seat, the lot. My budget wasn’t the biggest so I settled on the Daiwa 75 Seatbox. Although one of Daiwa lower range seatbox’s, it’s still a great piece of kit. The top compartment is perfect for my rigs, the long side tray has regularly used items in such as discorgers and then the 2 front draws contain my main terminal tackle. One side for rod fishing and the other for pole fishing. This was the most logical order I could come up with. The main bottom compartment has 2 reels in, a catapult and other similar bits and pieces. Although not massive, most of all my tackle fits in, but I can see the box being too small for people with a lot more terminal tackle. The footplate is my favourite part. It stores away with ease by loosening 2 of the knobs and you then you just pull the footplate out and lift up making carrying and storing the box a breeze. Speaking of carrying, this box is also light enough to get to those pegs where you can’t park your car behind! All in all I would rate this Daiwa 75 Seatbox as a great bit of kit for anglers looking to upgrade from their first beginners box or for someone with not too much tackle who wants to be comfortable at the side of commercial ponds and basically not spend too much. There’s plenty of accessories to buy to go with the Daiwa box too. The ones I am looking forward to getting is the bait waiter so everything I need throughout the session is within easy reach, a keep net arm to save having to find a place to stick the bank stick into, and a long feeder arm rest. The long feeder arm will make fishing the method effortless and will be great for the pellet waggler to rest the rod when catapulting those vital pellets in. Comment below with your thoughts on the Daiwa 75 Seatbox or just let me know which seatbox you own and treasure! Using the line clip I got the perfect position 3 or 4 inches away from the reeds and I was off. First cast, sinking the line and literally waited 2 minutes and I was into the first fish of the day, a hard fighting F1. This continued for the next few hours and it was great sport, and although nothing massive these fish gave a good little scrap. As well as the F1s I caught a lovely little tench which was a welcome change. I could see where I was casting starting to bubble, so much so the fish started to attack the feeder on the drop! I’d heard before I went that the slow sinking feeder could be a deadly tactic hear, and with the weather warming up I could see its potential. I have since bought a few slow sinking feeders and aim to go back to give them a try. Anyway after a while I decided the best bet was to just get onto the Pellet Waggler using the 6 mm pellets in the bait band and to catapult out. Again it was spot on and I caught a fair few more F1s. Not as prolific as the Method but still plenty. It started to cool down around 4 o’clock and then the rain came, but I wasn’t too bothered as I’d had a top days catching, losing count of how many I caught. It’s a great place to go for all anglers and would recommend to anyone. The cafe on site it great too and the sausage and bacon butties are a must. Ok, thought I would just update this post rather than creating a new one. I went back here on Sunday 8th September as it was decent weather and fancied catching a few. Went with a similar game plan as previous but intended to go on the pellet waggler around dinner time. Got there about half 7 and went on peg 16 which is quite close to the island again, with a nice little bay to target. Went on the method up to about 12 o’clock and bagged 18 F1s. It was warming up a bit so I went on the Pellet Waggler but this wasn’t half as fruitful as I’d hoped, with only 5 F1s in an hour. Went back on the method and must have caught another 20, again all F1s. So, another cracking day at Elm Tree Farm – so if you happen to go, try to get a peg that’s in reach of the island, and get on the method feeder within about a foot of it and you’re guaranteed to catch! As you can see from the pictures I only took the usual supermarket baits, with fishery pellets soaked in F1 liquid, and some meat covered in curry powder. I had one line of attack which was down the middle about 6 meters out. I started the session with a large cup of a mixture of micro and 4mm pellets, a few cubes of plain luncheon meat, and a few grains of sweetcorn and then went over the top with my rig and a cube of meat on the hook. Almost instantly I was into a nice common carp, it must have only been 50 seconds or so, I knew I was in for a good day. I carried on in this vain for a good hour or 2, catching carp between 2-4 Ib, staying on meat and with each bite using kinder pot to put in pellets. It then went a bit quiet and the carp deserted my peg because I started to catch a few bream so I had a change of tactic. I stopped with the pellets completely and just went with meat, both flavours. Earlier in the week I watch a Steve Ringer video so went with his tactic. 3 or 4 cubes of meat in a kinder pot, then lower the hook bait in at the same time. I got a rhythm going and it worked a treat, the carp came back and I caught 3 lovely Ghost carp on the trot. This tactic paved me well up to around 3 o’clock. I was leaving at 4, so for the last hour I went in the margins to my left. I was getting the odd nibble from little uns but nothing of much conviction until suddenly, bang another decent common. It was a strong one though as it streamed my 16 solid elastic but must have only been 5 Ib. All in all a great day with at least 30 fish caught, and confidence back, I can’t wait for next week! Studying the peg, I spotted 4 different swims. I plummed each up, with the margins being about half to a foot shallower than the middle. The 4 swims a chose was the margin either side of me, 1 about 10 meters out in the middle, and then the final one about 8 meters out but up against the reeds to my left under some overhanging trees. This is the one I had the best feeling about, and would be my main attack. I had heard before hand that the fish in the pond are always moving in and out and no matter what you do, you cannot keep them there all day, so having 3 or 4 swims was perfect. For the bait, I took Luncheon Meat, Sweetcorn and Pellets. You must use the fisheries own so I bought the 4 mm ones for feeding. I left half how they was, but flavoured the other half with F1 liquid. On all in, I potted in 2 medium size pots of pellets, with the odd cube of Meat, and few grains of Sweetcorn. For the hook bait I chose 8 mm cubed plain luncheon meat. I was in literally minutes later on what felt a very good-sized fish. I rushed it a bit though and lost it. After that, my aim was to land every fish, no matter how long it took. 5 minute later I hooked another very good carp, which ended up being the biggest catch of the day – a 7.13 Ib Mirror carp. After the thrilling start, I caught steady all day, staying in the same swim, on meat, feeding in with the 4 m pellets. If it quietened down, I would catapult in the pellets instead of potting them in to make a bit of noise to attract the fish back in. I caught all breeds of fish, from small hard fighting tench and f1’s, to very reasonably sized Mirror and Common Carp. For the last 45 minutes, I decided to go into the close margins to my right, having been feeding in handfuls of pellets and corn all day. Using my very simple margin rig of a preston tyson float with one heavy shot, I started bagging some barbel and had about 5 on the trot. The final fish of the day was a nice sized common. The match wound up, and I had enjoyed myself greatly with everyone catching very decent. I was thrilled to learn I’d WON the match with 59 Ibs 2 oz! If you are thinking it, do itA great saying but can’t remember where I saw it If you are thinking it, do it. If you are the owner of Ryan's Fishing Blog, or someone who enjoys this blog why not upgrade it to a Featured Listing or Permanent Listing?